How can it be used? 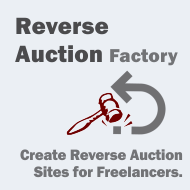 The most popular choice for Reverse Auction Factory is to set it up as a freelancer website, similar in workflow to more well-known websites like Elance or Freelancer or Upwork. It offers the perfect terrain where supply and demand meet for software development, digital art, webdesign, proofreading, and the list goes on. An important aspect implies that both freelancers and auction masters maintain a certain level or transparency when collaborating for a project, which is why some of Reverse Auction Factory's features are allowed support for NDA, as well as file attachments for auctions or bids like drafts, signed contracts, time sheets, etc. which are allowing a better project overview. In other cases, this Joomla! component serves as the perfect tool for gathering suppliers from various industries on the same procurement platform. 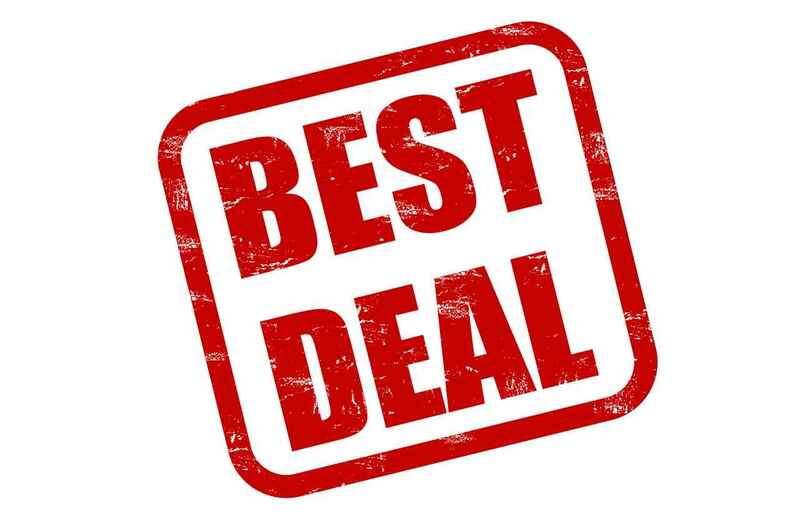 Medium to large companies will always want to get better deals for Xerox paper, ballpoint pens, and even for industrial equipment used in irrigations, farming, pharmaceutical testing facilities, etc. How does monetizing work? As the administrator of a Reverse Auction Factory based website, there are several ways to make the entire experience worthwhile, financially speaking. First of all, both auction masters and bidders can be charged commissions for their listings; furthermore, there are various payment items set in place such as Pay per listing, Pay per bid, Pay per contact or Pay for featured auctions, which can have unique prices or just an universal one. Preferential pricing may also be set up for powerbuyers or verified users, to encourage the ongoing activity of such account and also to boost their visibility within the formed community. With this structure in mind, we have considered useful to also offer a more targeted solution, where the prices are not a variable factor like in Reverse Auction Factory, but they are defined by each webmaster for the site in question, giving so birth to sites like 5$deals, where the users can offer their services or certain goods for exactly 5 USD. 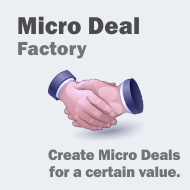 Micro Deal Factory is a more defined business strategy offering a settled environment, where only the quantity can vary, but the price per unit remains the same. What is it? Odd jobs and temporary jobs have started to gain terrain in the workforce industry during and after World War I, and with the beginning of the modern age, as the internet made its way in virtually each household, the number of requests has vertiginously shaped a new category of earners: the micro workers. Micro Deal Factory was designed to help micro workers and micro employers meet halfway, offering a complete system for selling goods or services. How can it be used? Users who wish to sell goods at he site price or seek people for a certain service have the possibility to create a Seller account on the site, which can also be linked to their desired payment gateway (Paypal and Moneybookers/Skrill). Usually, in terms of services, the most commonly sought ones are for creating logos or avatars, drawings, babysitting, house cleaning, pool maintenance, writing articles for blogs, and basically anything involving short term commitment. Another option would be for users to sell various items, while maintaining the set price of the site (online second hand stores have also become popular within the last few years). For those who wish to have a trust fund set up throughout their collaboration, Micro Deal Factory also has a full escrow payment system. This way, the amount of money equivalent to the initiated task would be kept safely until its completion. How does monetizing work? In order to benefit from managing such a website, the administrator needs to focus first on gaining a substantial user-base, which can increase also the number of finalized deals. If there is an increased user base, commissions can be applied to the withdrawals requested by users, however it is essential for the site to be busy, with constant withdrawal activity. The more people know about it, the more users sign up, then generate as many sales as possible, so quality marketing and advertising play a very important part in obtaining satisfactory revenues.